Students of Dibrugarh University in Assam on Monday used blood as ink on placards and banners to express their opposition to the Citizenship (Amendment) Bill, 2016. 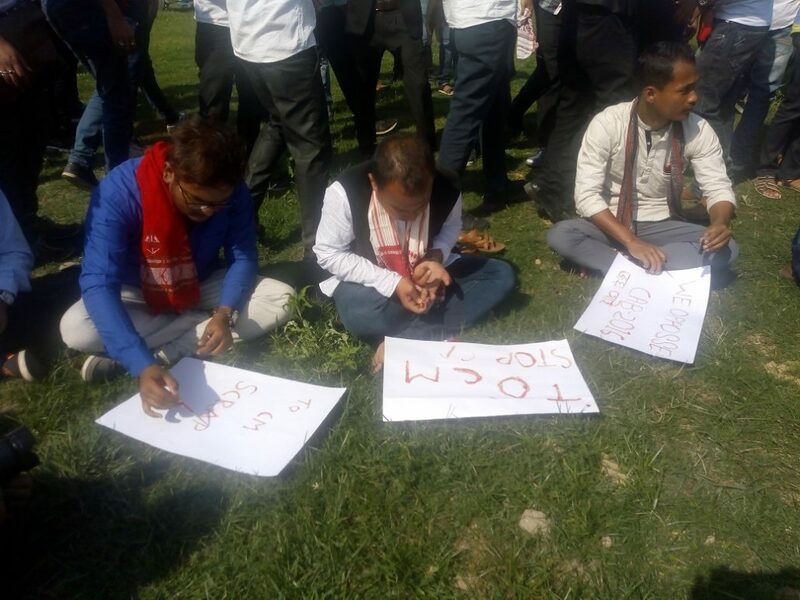 The unique protest which was named ‘Rokto Hapath’ (Pledge by Blood) saw several students drawing blood from their hands using syringes and blades and using the same to write on the placards and banners demanding scrapping of the Citizenship (Amendment) Bill. 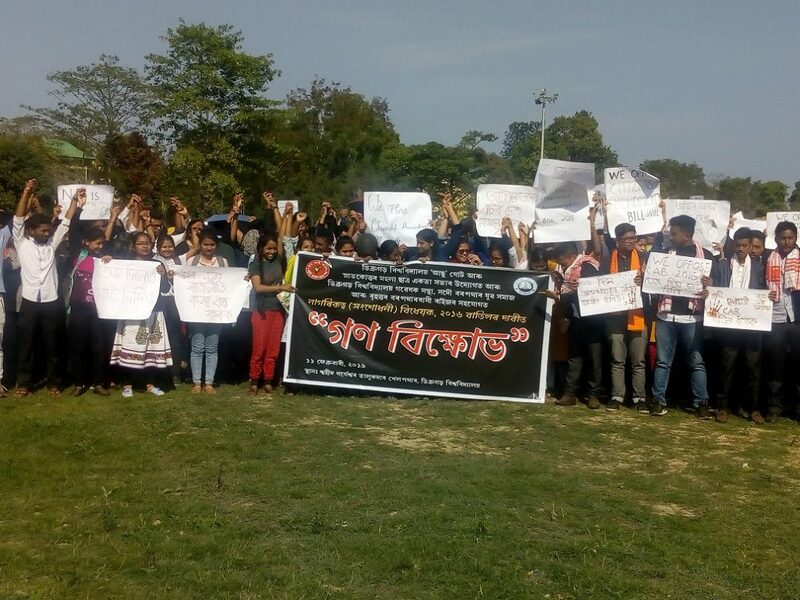 Members of the All Assam Students’ Union, Dibrugarh University branch, Dibrugarh University Research Scholars’ Association, All Borpathar Yuva Samaj, Asom Jatiyatabadi Yuba Parishad and several other organizations as well as prominent citizens of Dibrugarh also participated in the protest rally held at the Swahid Khargeswar Talukdar playground inside the university campus. Representatives of the participating organizations also addressed the gathering and spoke unanimously against the citizenship bill. The protesting students also raised slogans against the BJP government for its stand on the bill. Earlier, the students of Dibrugarh University had decided to boycott classes indefinitely in protest against the contentious bill. 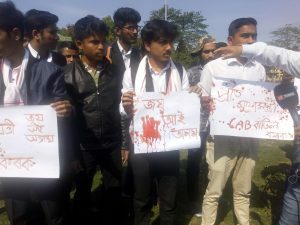 The Dibrugarh University Post-Graduate Students’ Union (DUPGSU) had already banned the entry of BJP leaders including chief minister Sarbananda Sonowal inside the university campus. “We appeal to the student community of Assam to unitedly raise their voice against the Citizenship Amendment Bill. We are ready to give our blood and even our life to compel the government to withdraw the controversial Bill. This bill if passed will prove a death knell for the people of Assam,” DUPGSU general secretary Devid Hazarika said addressing the rally. On the other hand, AASU members waves black flag, balloons and burnt eggify of chief minister Sarbananda Sonowal near Dibrugarh AASU office. Widespread protest was witnessed in Sonowal’s home district Dibrugarh after the bill was tabled in the Lok Sabha. The protesters blocked the road which disrupted the traffic for some time.